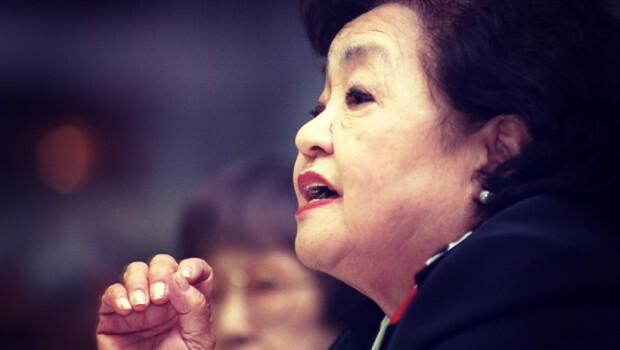 ON FRIDAY 28 March, Ms Setsuko Thurlow, a survivor of the atomic bombing of Hiroshima, will speak at the Royal Irish Academy in Dublin. As a 13-year old schoolgirl, Thurlow was one of a group of 30 students assigned to help at an army headquarters in central Hiroshima. She was on the second floor of a wooden building, ready to start her first day of work, when at 8:15 am Little Boy detonated about a mile away with the explosive force of 17,000 tons of TNT. “People at a distance saw the mushroom cloud and heard a thunderous roar. But I did not see the cloud because I was in it … Streams of stunned people were slowly shuffling from the city centre toward nearby hills. They were naked or tattered, burned, blackened and swollen. Eyes were swollen shut and some had eyeballs hanging out of their sockets. As a survivor of one of the most infamous events in modern history, she continues to display great courage in sharing her experiences. She does so in order to sensitise us to the often-ignored consequences of armed conflict on civilians and to promote the continued importance of disarmament. Thurlow will be participating at a major disarmament and non-proliferation symposiumorganised by the Department of Foreign Affairs and Trade, the School of History in UCC and the Japanese Emabassy in Dublin. The symposium is an educational initiative designed to promote awareness of historical and current disarmament issues, both nuclear and conventional, through a panel-style discussion delivered by a mix of leading academics, civil society, policymakers and practitioners. The event will also see particular attention given to the role played by Ireland in disarmament and non-proliferation matters, with a keynote address to be delivered by Minister of State for Trade and Development Joe Costello TD. The Irish role in disarmament is widely acknowledged in diplomatic circles but is perhaps less well known among academics and the general public. Yet, Ireland has a long record and strong pedigree when it comes to disarmament. The Nuclear Non-Proliferation Treaty (NPT), the most widely adhered to arms control treaty in history, has its roots in a series of resolutions put forward by Ireland between 1958 -1961. The fundamental logic behind the Irish thinking on the problem consisted of the belief that an increase in the number of States possessing nuclear weapons would lead to the increased likelihood of their use; a logic that has become widely accepted in nuclear diplomacy. The treaty is now unanimously regarded as the main international mechanism for controlling the spread of nuclear weapons and contains the only multilateral commitment to nuclear disarmament in the text of a treaty by the five recognised nuclear-weapon states. Of course, the NPT is not perfect. Israel, India and Pakistan remain outside of the Treaty and North Korea withdrew after it developed a nuclear weapon clandestinely. Growing tensions between the US and Russia as well as the threat of non-state actors acquiring nuclear material means that we all continue to live under the spectre of a nuclear exchange. While maintaining the legal bulwark of the NPT, efforts are now beginning to focus on the humanitarian impact of nuclear weapons and calls for an outright ban, as we have with chemical and biological weapons, are growing. This is very much in keeping with the original objective of the NPT. As then-Minister for External Relations, Frank Aiken, remarked, the Irish 1958 – 61 Irish resolutions should be “conceived as [a] step towards the restriction of nuclear weapons – a restriction which in its turn would be a step towards their abolition”. Indeed, humanitarian concerns have been the main driver in Ireland’s conventional disarmament campaigns. The adoption in April 2013 of the Arms Trade Treaty, a legally-binding agreement to govern the colossal global trade in conventional arms, is seen as a significant achievement that will prevent human rights abusers and violators of the law of war from being supplied with arms. The last 15 years have also seen major advances in the prohibition of certain conventional weapons, including anti-personnel landmines and cluster munitions. Irish efforts on banning cluster munitions were inspired by its tradition of involvement in UN peacekeeping operations in the Lebanon and former Yugoslavia. There, Irish troops were exposed to the dangers inherent in clearance of unexploded ordinance and witnessed first-hand the harm they cause to civilians. Irish Aid agencies too acknowledged how these weapons hampered development in post-conflict countries attempting to rebuild their shattered economies. Following a successful diplomatic campaign by a small core-group of countries, including Ireland, the Convention on Cluster Munitions was agreed at a diplomatic conference in Dublin in May 2008. The treaty outlaws all use, production, transfer and stockpiling of cluster munitions to address the humanitarian consequences and unacceptable harm caused by the use of cluster munitions. While certain states that manufacture cluster munitions are yet to sign, the treaty has engendered a stigmatisation of their use among the international community and its victim assistance provisions are already having a meaningful impact on the most affected countries. At the Peace Park in Hiroshima, the cenotaph is inscribed, “Rest in peace; the mistake will not be repeated”. However, we cannot be complacent. Only through continued advocacy, education and the work of survivors like Setsuko Thurlow will we ensure that the promise is kept.